After completing a to-do item, scratching it off on paper can be quite satisfying. It has a feeling of finality that tapping on a check box just can’t match. Tapku’s To-Do Lists tries to bring that feeling of satisfaction to the iPhone. To-Do Lists has a clean aesthetic and a unique way to complete tasks. Rather than tap a check box, you slide your finger over the to-do—like scratching it off on paper—to mark tasks as finished. Unfortunately, new to-dos cannot be created by moving to the next line, as you would if you were dealing with a paper list. Instead, you must tap a button in the top-right corner to add a new to-do. While this is not any different from other mobile task managers, it feels like an unnecessary step in To-Do Lists, given the app’s paper metaphor. Worse, managing lists through To-Do Lists is unintuitive. The app uses arrow buttons to move between lists. It would be much more powerful and iPhone-like to move between lists by swiping. To-Do Lists has a great aesthetic and metaphor, promising the satisfaction of a paper list. But Tapku’s navigation choices break the illusion. Make a few changes to those controls, and To-Do Lists could become a very effective simple task manager. 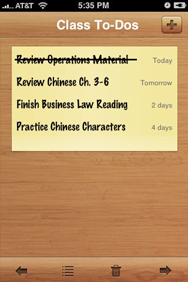 To-Do Lists is compatible with any iPhone or iPod touch running the iPhone 2.2.1 software update.